Second Tuesday of every month called Microsoft patch Day 🙂 Patches get released and configmgr* guys busy in testing ,moving them to production. As usual, I have Downloaded the patches,added to the package,deployed to Distribution Points ,all returned success (Decompressed the PCK successfully).Until here Good. ContentTransferManager.log--> logs when client attempts to download content from the first distribution point listed in the content location. DataTransferService.log --->Logs if a job has been created to download the files to the client or not. GetDirectoryList_HTTP('http://servername:8530/SMS_DP_SMSPKGH$/packageID/14eb1517-9a6f-461d-9dd6-656d876efbe4') failed with code 0x8004027e. From the above logs,we know ,client is having issues while getting the required patch content from the Distribution Point.Client keeps trying for longer period but nothing happens. take a look at IIS logs if it gives any further clues. From the above snippet,you can see an error code 401 which is access denied. I then looked at the Update ID if it really exist in the package folder or not ? Browse H:\smspkgh$\packageID for content 14eb1517-9a6f-461d-9dd6-656d876efbe4 . I can not find it though my package is successfully decompressed and sent the status message to central site. I compared the patch package properties with working server properties,i see there are 100+ files missing. something interesting to know ? why did this happened ? have no time now to troubleshoot why did this happened may be later but for now ,try to fix Preparing for Installation . I don't know if there is hash value for each update that is created and downloaded by Configmgr but i gave a try to copy the missing Update IDs manually from working server to Issue DP. 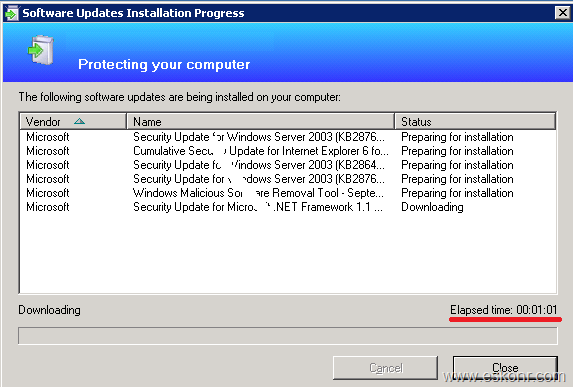 open configuration manager applet from control panel,initiate software update deployment evaluation cycle and software update scan cycle ,few min later you will see prompt asking to install the Windows updates if the deadline is not reached. Restart the SMS agent host,end the sccm client user interface,initiate the software update actions,it DID . To avoid this issue on other clients,get the missing patch content from working server . 6 Responses to "SCCM Configmgr 2007 Software Updates Stuck at Preparing for Installation Error sending DAV request HTTP code 404 status ‘Resource Not Found’"
I would like to know how to delete this updates from Clients Laptops ?? how do you mean client laptops ? more info needed. Security Updates for Microsoft .Net Framework 3.5 and 4 failed. on Windows 7. Please email me solution and steps need to follow to correct this error. did you check the logs ? updatesdeployment and deploymentstore.log and other sup logs on the client ?